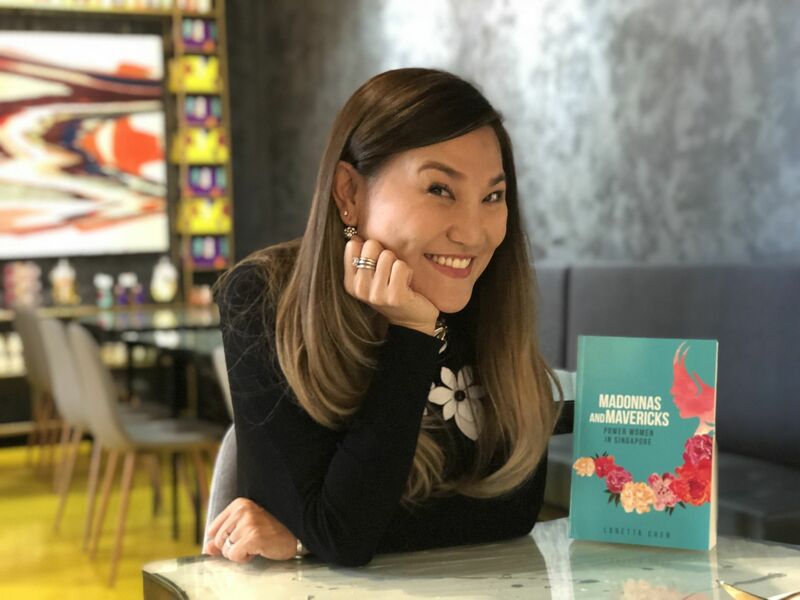 Singapore’s power women open up to author Loretta Chen about pushing boundaries and breaking glass ceilings, while maintaining a demanding career and a fulfilling home. The topic at hand: “Women and Leadership in the 21st century” and the panel read like the who’s who of power women in Singapore—entrepreneur Tjin Lee, Paralympian Theresa Goh, opposition leader Sylvia Lim, former wildlife company chief Fanny Lai, farmpreneur Ivy Singh-Lim, and grocer Nichol Ng. How did anyone manage to bring these exceptional women together in one room? Well, Loretta Chen did just that at the launch of her latest book, Madonnas and Mavericks: Power Women in Singapore in November last year. In her book, the author spoke to 17 women across diverse fields such as business, politics, sports and the arts, who have contributed to Singapore’s growth and redefined what it means to be a woman today. Also featured are Singapore’s first female president Halimah Yacob, diplomat Chan Heng Chee, business head honchos Odile Benjamin, Cynthia Chua, Jennie Chua and Olivia Lum, ophthalmologist Geh Min, pastry chef Janice Wong, veteran actresses Janice Koh and Xiang Yun, as well as violinist Siow Lee Chin. Through interviews with Chen, these multifaceted women offer insights (kept in their own words in the book) on feminism, career and motherhood, the concept of “having it all”, and how they juggle their multiple roles—a question, they point out, that is rarely directed at men. Chen tells us more. How did the title Madonnas and Mavericks come about? Loretta Chen (LC) For the book, I defined madonna as a steadfast and virtuous woman after the Judeo-Christian tradition. She is a disciplined professional with specialised masteries that have taken her years to hone and cultivate. This contrasts with maverick, who is born out of today’s fast-paced environment, a game changer and a dynamic individual who takes the bull by its horns and seeks new adventures. What is your definition of the 21st-century woman? LC Being a 21st-century woman is to be open-minded, flexible and adaptable. Some of the ladies dispel the myth of “having it all”, while others relish in their ability to maintain a delicate balance between a demanding career and a fulfilling home. In short, being a woman in today’s context entails an ability to recognise and respect the immense diversity that exists between us; and to always take accountability for one’s actions irrespective of gender—the latter is the one common denominator that binds all of these women. If we add the word “leader” in the mix, the 21st‑century woman leader has to be adaptable, adroit and amiable, especially in the world of social media. Whose story resonated with you the most? LC Honestly, they all resonated with me, but if I had to pick one, it would be Nichol Ng, the managing director of FoodXervices and founder of The Food Bank Singapore. Her sharing of her eating disorder is admirable and relatable. Like her, I was seemingly strong, confident and an overachiever, but deep down, I too shared the same insecurities and dabbled with slimming pills, body wraps and laxatives before coming into my own in my 30s, where I was much more comfortable being in my own skin and found my own voice. The media’s emphasis on physicality and the constant need to curate one’s lives on social media can inadvertently send out negative messages to our young. I think media owners, influencers and personalities should take the time to counter this “skinny-skinny-skinny-sell-sell-sell” narrative with one that celebrates diversity in body types and sizes, and elevates personal triumphs and achievements over sheer physical beauty. Can you share with us a three to five-word description of each of them? Theresa Goh: spunky, zany, strong swimming champ! Janice Wong: pint-sized and bursting with flavor! Who were your female role models growing up, and who do you look up to today? LC My mother for her unconditional love, fierce loyalty to her children, tireless dedication and her ability to always roll with the punches; Madonna, the 1980s queen of pop, for her creativity, passion and daring to dare in an era where women were not supposed to be quite so brazen; Aung San Suu Kyi is an ambivalent character today especially with the Rohingya crisis, but growing up, I admired her greatly. She was an intense intellectual, freedom fighter and a symbol of quiet resilience and grace under pressure. Today, and in a local context, I would say Sylvia Lim is my #girlboss. Her sense of patriotism and dedication to Singapore and courage is the stuff myths are made of. She is smart, articulate, humane, and has the tenacity to stick to her guns, earning her the respect of even her biggest detractors. Singaporean women have made great strides in society, but many still experience challenges in the workplace. How can we improve this? LC Power women need to carry themselves and ensure that they don’t become victims of bias. They must dare to break stereotypes and not be afraid to stir controversy if it benefits the greater good. This entails using their position of power to effect change, to drive innovation and transformation that has a lasting impact, and getting their hands dirty and feet wet. In addition, women need sponsors and mentors. We have to identify other high potential women and map their way up, while ensuring their mentors guide and cushion their fall. The journey is not painless but ultimately rewarding and fulfilling, if you pay it forward. Are you a madonna or a maverick?